(Toronto, Ont.) Paul Bowes has been part of the Canadian wheelchair basketball community for over two decades, from coaching athletes new to the sport to some of the top high performance athletes in the country. His coaching has brought him around the globe to world championships and Paralympic Games. Over the past year, Bowes has brought his immense coaching experience and passion for the sport to another level as the head coach of the Canadian Invictus Wheelchair Basketball Team that will compete this week at the 2017 Invictus Games on home soil in Toronto, Ont. The Invictus Games are an international adaptive sports competition for wounded, injured and sick service members and veterans. The Games use the power of sport to inspire recovery, support rehabilitation and generate a wider understanding and respect of all those who serve their country. It was the philosophy of the Invictus Games that inspired Bowes, a native of London, Ont., to get involved as head coach. “The reward for me is knowing that many of these athletes are falling in love with sport,” said Bowes. “The philosophy is not about reaching the finish line or the end of the game, it is about making it to the starting line, the first tap ball, and they have made an amazing choice to put themselves out there on a world stage and to be proud to wear the red and white representing their country once again. For most of the Canadian team the 2017 Games mark their first foray into wheelchair basketball. “Most of our team had little if any experience in the game and they have come together as a team in a very short time. We have gone over FUNdamentals to keep them engaged and we have worked on chair skills and ball handling,” explained Bowes. 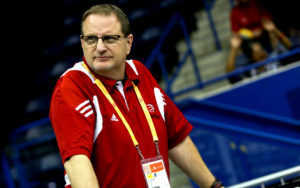 Upon taking up his head coaching duties, Bowes put the call out to fellow coaches, athletes and volunteers in the Canadian wheelchair basketball community. An amazing response from the community helped get the team ready for the games. Training camps for the Invictus athletes were held across the country. Coaches like Tim Frick, Simon Cass, Katie Miyazki, Marc Antoine Ducharme, Steve Sampson and Joe Higgins, among others, pitched in to help along the way, with athletes dropping in to visit with the team as well, including the likes of Patrick Anderson. “We come into these games very fresh but extremely focused and motivated to compete. Compete is our word and the scoreboard is only there to keep score, it certainly will not define the effort and passion these athletes have put into this sport, training hard all summer long,” said Bowes of what spectators can expect from the competition. Overall this experience has reinforced the positive impact that wheelchair basketball and the power of sport can have for the athletes and for Bowes himself as a coach. “I have learned that sport is truly a healing experience, and the comradery that is being developed on this team, not only our basketball team, but the Invictus team and the Invictus teams around the world, are benefiting from the power of sport and pushing themselves to their personal bests.